I dont know how the floating light tanks will affect sea based maps. Very interesting idea - I'll give you that. Seems unfair that only allies would have the ability though. @Lucian: The point is playing the maps and then giving feedback. Theorizing here is kinda mute.. The light tanks are only light tanks, so easily destroyable by subs, rocket soldiers others ships. But MIX it is great fun over all. I have hosted about 20 matches and have received very positive feedback. Only one person (winning) was complaining that the Cruisers are OP now (I disagree, they are useful now). All other features got accepted. Also I have version 004 of AVI out, which now includes the long awaited soviet answer to the chronosphere! A superheavy transport plane (transports even MCV, nuke truck excluded). Build limit is one and price tag 2500, requires tech center. Not sure on balance yet, imho its very powerful, but it seems using it "costs" a lot of micro as well. @mustapha: I could solve paradropping with a script! Use everything in your map if you like. SirCake wrote: ↑ @mustapha: I could solve paradropping with a script! Use everything in your map if you like. I have coded https://github.com/OpenRA/OpenRA/pull/14276 in for a proper Soviet Cargo Plane logic, but of course i can't use that for testing. I'm ok with how it currently is tbh. I will do no further RA playtests. Last edited by SirCake on Sat Mar 10, 2018 3:22 pm, edited 6 times in total. Really great work, Sircake! Haven't been able to play much to test them, I'm curious which changes are most fun and viable. I am really exited with this! SirCake was creative and it worked amazingly! every game i had was fun! and i mean fun! nothing less! i suggest to any one to play the maps. I really like the UOE maps and changes. Interesting idea with the construction yard power. Iwould have liked if you didnt change the keybindings, but its ok. i can live with it. I like the idea with the flak sub and stealth detecting air units. makes interesting new naval/air play. Bug: I really like the cossack, but i had some bug with unloading it. had 12 units in it, but it only unload the half of it and then flew back to the airfield. Maybe should check that because it should unload all. And i find it odd, that you cant unload units on the airfield. Would be nice if you can change that, but if you maybe change your mind about what unit to transport, you have to drop them with parachute just to change the cargo. feels odd, if you cant unload when its on the airfield. I think the Camo SAM site has slower reaction in shooting down air units. tested it with CAMO Sam site and normal SAM site next to each other, the normal SAM site immediately fires, the CAMO SAM site has to come out from underground first, due to mechanic. maybe increas reaction time? I think I would increase the missile sub damage, because a cruiser destroys a construction yard with 5 volleys and a missile sub needs 7 volleys. or any other reason why the damage is so low compared to cruisers? Everything else I like! Keep up the good work! Swimming Tanya in RA1. That's the spirit! Gave it a shoutout at https://plus.google.com/+OpenRAnet/posts/F86pxz8gkkA Keep up the good work! Hey, thanks for the shoutout and for the positive comments! @J2k4u: The missile sub has other advantages than the cruiser. It is faster, can submerge, has tracking missiles and is cheaper. The cost-dps-ratio is pretty close anyway! The cruiser is a much more obvious threat with more range, more upfront damage and more HP. I think to give aircraft players reaction time is actually good thing, that is why I also reduced the deployment speed of the AA Gun and other defenses. I love the love naval is getting and thanks for putting in the effort for a test just as Omnom had done for his build queue tests. Shaking the tree before itâ€™s implemented prematurely is commendable work. Havenâ€™t given these a go yet but I notice the map caterings are either pure naval or have not seen much naval play in the past. If youâ€™re looking to see how these compare to maps that see modest naval play now and again I would love to see your implementation on some of my maps! - Decrepit Isles (2v2), has seen ~20% of games involving some form of navy. Would be interesting to see how this mod alters that dynamic. - Timorous Expansions (1v1), the most dynamic mix of naval, land, and air units Iâ€™ve managed to create out of my maps. - Skewed Intentions (1v1), rarely sees naval play beyond transport or sometimes tier 3, but may allow Tier 3s to have a bigger effect inland. Hey, I have some statistics for you. I counted how many times each of my playtests has been played across all revisions up till now. Maritime Inclusion eXtended (MIX) leads by far with 73 games played, of which a whopping 27 were played on Doubles Islands. Followed up by the UOE playtest with 32 games played - one person even went ahead and copied the rules to their favourite map (bomb. islands). Air Viability Increased (AVI) counts 22 games and the other playtests I made are negligible. Hey, just uploaded UOE v003. The links under the picture are already pointing to the new version. * Random tips are displayed in-game every minute. Changelog moved from lobby to in-game chat. * missile sub shoot 1 missile less (-17% dmg) so dps is lower than the cruiser's. * Mig gains three ammo pools for air targets (aa-missiles), vehicles and defenses (missiles) and buildings, infantry and submerged subs (bombs). Less weapon range. * Increased tracking range of SAM site. Fire rate reduced 25%. Missiles can sometimes be evaded. * License for my own artwork added. Click this image to see a graphical changelog and a full text changelog on postimages.org. 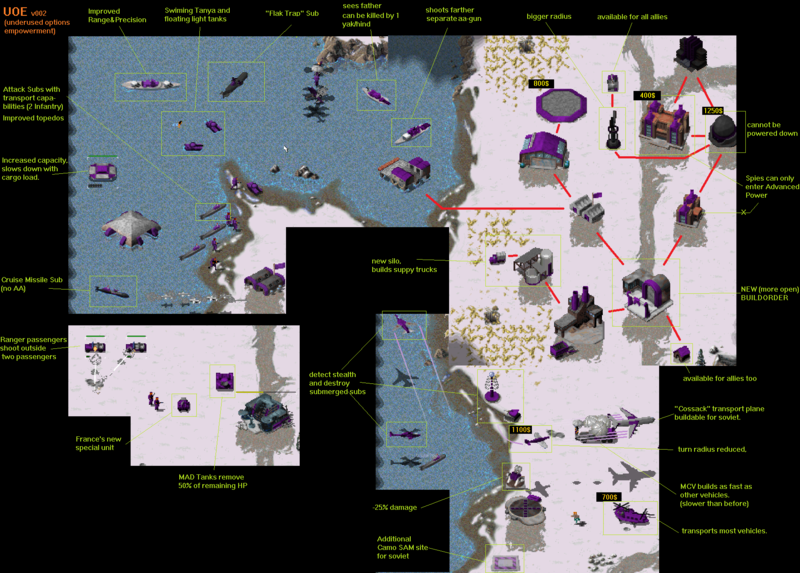 New fixed version (sam&cossack) uploaded - all "old" v005 maps deleted. Last edited by SirCake on Sun Mar 11, 2018 10:17 am, edited 8 times in total. Good work. I enjoyed the previous games on this so will try out again when i get internet back. I got bored & made new icons for the units, you want them?